Powerful, Efficient HVAC System - Frazer, Ltd.
Ice cold air conditioning provided by a self-contained 120V HVAC system has been a hallmark of Frazer products since our first day in the industry. Our customers know a cold environment is critical to quality patient care, especially with cardiac trauma. The self-contained unit we install functions identically to and has the equivalent cooling capacity of a one-ton home HVAC unit; it requires no hoses or tubing to be run through your module, and comes with easily accessible charging ports should you need them. Keep your environment cool whether on call or in the station with our 120V shore line input. Our system carries an industry-leading four (4) year warranty (no mileage issues) and can be swapped out in under one (1) hour if necessary. 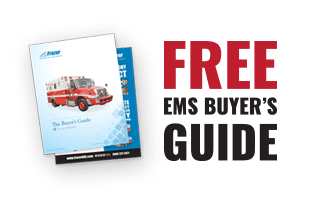 The typical industry approach to ambulance HVAC has been to simply extend the chassis 12 Volt system to try and provide adequate cooling for the module. Except in extremely temperate climates (and even that’s debatable), this has led to consistently poor performance. The cab/chassis AC system was engineered to cool a much smaller space than an ambulance module, so a typical competitor solution is to try and supplement the factory design with an extra condenser on the front wall. Or a separate roof-top unit. Or a shoreline only unit. Or some other poorly conceived band-aid solution. Along with extending supply lines through the front wall of the module, this additional hardware represents a potential maintenance nightmare. Add the fact that these truck-based systems are only designed to perform when in motion, so when a vehicle has to sit on scene, the lackluster cooling efficiency only gets worse. As for warranty coverage, good luck with that.